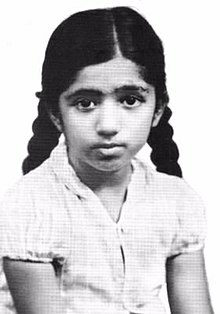 Lata Mangeshkar was born in 1929, the eldest daughter of Master Deenanath Mangeshkar, a Marathi musician and his Gujarati wife Shevanti in Indore (today in Madhya Pradesh and then the capital of the princely state of Indore which was part of the Central India Agency in British India). Her father, Pandit Deenanath Mangeshkar, was a classical singer and theatre actor. Her mother, Shevanti (later renamed Shudhamati), a Gujarati woman from Thalner, Bombay Presidency (now in northwest Maharashtra), was Deenanath's second wife; his first wife Narmada, who had died, was Shevanti's older sister. Mangeshkar's paternal grandfather, Ganesh Bhatt Navathe Hardikar (Abhisheki), was a Goan Padye Brahmin priest who performed the abhishekam of the Shiva lingam at the Mangueshi Temple in Goa; and her paternal grandmother, Yesubai Rane, belonged to the Gomantak Maratha Samaj devdasi community of Goa. Mangeshkar's maternal grandfather was Gujarati businessman, Seth Haridas Ramdas Lad, a prosperous businessman and landlord of Thalner; and Mangeshkar learnt Gujarati folk songs such as garbas of Pavagadh from her maternal grandmother. ^ "Lata Mangeshkar". The Times of India. 10 December 2002. Retrieved 2009-07-22. ^ Yasmeen, Afshan (21 September 2004). "Music show to celebrate birthday of melody queen". Chennai, Tamil Nadu India: The Hindu. Retrieved 2009-08-19. ^ a b "Unplugged: Lata Mangeshkar". The Times of India. September 20, 2009. ^ a b Vashi, Ashish (September 29, 2009). "Meet Lata-ben Mangeshkar!". Ahmedabad: The Times of India. ^ "Kavi Pradeep, master of the patriotic song, dies at 84". Rediff.com. 11 December 1998. Retrieved 2010-11-04. ^ "Madan Mohan & Lata made each other famous | The Indian Sub-continent Times". Theistimes.com. Retrieved 2014-08-06. ^ Raju Bharatan (23 August 2006). "How fair were they to Mohammed Rafi? : Page 3". Rediff.com. Retrieved 2007-04-28. ^ Raju Bharatan (21 August 2006). "How fair were they to Mohammed Rafi? : Page 4". Rediff.com. Retrieved 2007-04-28. ^ "MADAN MOHAN... The Musical Legend | The Official Website of Madan Mohan". Madanmohan.in. Retrieved 2014-08-06. ^ "Milestones in the life of melody queen Lata Mangeshkar". Hindustan Times (New Delhi, India). 27 September 2008. Archived from the original on 8 February 2016. Retrieved 18 January 2018 – via HighBeam Research. (Subscription required (help)). ^ "Raj Kapoor: The face behind the star". Hindustan Times. Archived from the original on 17 September 2013. Retrieved 2014-08-06. ^ Jayasankaran S.V. (2011-06-12). "Jay'S World Of Music: Lata Mangeshkar-Her Favourite Songs". Jaysworldofmusic.blogspot.com. Retrieved 2014-08-06. ^ Jha, Subhash K (2010-06-27). "'I knew him from the time he ran around in shorts'". Mid-day.com. Retrieved 2014-08-06. ^ Suparn Verma (3 November 1999). "A perfume called Lata". Rediff.com. Retrieved 2007-08-13. ^ a b Viral Bhayani (29 November 2002). "Unequal music". The Times of India. Retrieved 2007-08-13. ^ "Straight Answers". The Times of India. 2 March 2003. Retrieved 2007-08-13. ^ "Leave me alone, says Lata". The Times of India. 5 March 2003. Retrieved 2007-08-13. ^ "Lata Mangeshkar's jewellery collection raises quake relief funds". 28 November 2005. Retrieved 2007-08-13. ^ "Lata Mangeshkar launches new album 'Saadgi'". Daily News & Analysis. 21 June 2007. Retrieved 2007-08-13. ^ "Lata Mangeshkar, Nevaan Nigam steal Sarhadein show". Indian Express. 2011-04-22. Retrieved 2014-08-06. ^ "Lata records song with Nadeem — Rediff.com Movies". Rediff.com. 2003-01-03. Retrieved 2014-08-06. ^ "Lata records for Satrangee Parachute". Indian Express. 2010-12-17. Retrieved 2014-08-06. ^ "Lata is back in playback". Mumbai Mirror. 2014-05-19. Retrieved 2014-08-06. ^ "Lata Mangeshkar launches music label with 'bhajan 'album | Latest News & Updates at Daily News & Analysis". Dnaindia.com. 2012-11-28. Retrieved 2014-08-06. ^ "Music director, Lata Mangeshkar - Times of India". The Times of India. Retrieved 2017-02-04. ^ Raju Bharatan (23 August 2006). "How fair were they to Mohammad Rafi? : Page 7". Rediff.com. Retrieved 2007-04-28. ^ Raju Bharatan (23 August 2006). "How fair were they to Mohammed Rafi? : Page 6". Rediff.com. Retrieved 2007-04-28. ^ Puri, Amit (24 February 2003). "Dedicated to Queen of Melody". The Tribune, Chandigarh. Retrieved 2009-08-18. ^ Chopra, Yash (28 September 2004). "The nightingale of India turns 75". BBC News. Retrieved 2007-08-13. 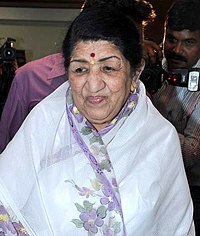 ^ "Melody Queen Lata rings in 75th birthday quietly". The Tribune, Chandigarh. 29 September 2004. Retrieved 2007-08-13. ^ Banerjee, Soumyadipta (22 October 2011). "It's a world record for Asha Bhosle". DNA India. Retrieved 2011-10-23. ^ "Most studio recordings - singles and albums combined". GuinnessWorldRecords.com. Retrieved 2018-11-24. 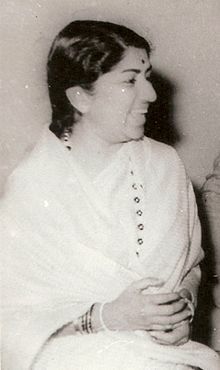 Lata, Mangeshkar (1995). Madhuvanti Sapre; Dinkar Gangal, eds. In search of Lata Mangeshkar (in Marathi). Harper Collins/Indus. ISBN 978-81-7223-170-5. . A collection of articles written by Lata Mangeshkar since 1952. This page was last edited on 18 April 2019, at 09:01 (UTC).